The insulin test checks the insulin blood level. What is an insulin test? The insulin level test measures the insulin blood level. Why is an insulin level test important? This insulin blood test helps track insulin levels and can help assess insulin resistance. This Insulin Test is a blood test. The insulin test, also known as an insulin blood test, insulin level test and an insulin lab test, measures the insulin blood level. Insulin is a hormone made by the beta cells of the pancreas and has a wide range of functions. Primarily, insulin functions to regulate blood sugar in the body. Insulin does this by metabolizing macromolecules like fats and protein, leading to increases in the blood glucose level. Elevated insulin levels may be related to chronic low blood sugar states, acromegaly, fructose intolerance, obesity, and other syndromes. Additionally, elevated insulin levels are also seen in people with insulin resistance. The production of insulin by the pancreas is regulated by a dynamic feedback loop related to the blood glucose levels at any given time. When glucose levels are high, insulin is secreted in an effort to store the excess blood sugar and, ultimately, lower blood glucose levels. In contrast, insulin secretion is shut down when blood sugar levels are low, allowing glucose levels to rise in the blood. Given its intimate relationship with blood glucose levels, this insulin blood test is sometimes done at the same time as the glucose blood test. In most cases, people with diabetes have issues with how insulin is produced or works in their bodies. In type I diabetes, insulin cannot be produced in adequate amounts by the pancreas, necessitating supplementation with external insulin (e.g. insulin injections). In type 2 diabetes, insulin is less effective when impacting receptors that enable processes that cause extra blood glucose to be stored. As a result, less glucose is stored and blood sugar levels rise. Occasionally, an insulin test might be performed to look for an insulin-producing tumor, particularly when one has persistently low blood glucose levels. Additionally, an insulin test, in conjunction with a C-peptide test, can help assess any discrepancies related to how much insulin is being produced by the body when one is also taking insulin as a medication. Insulin test levels are sometimes drawn with the glucose test during a glucose tolerance test in an effort to check for insulin resistance. Even with normal insulin levels, it is important to highlight the concept of insulin sensitivity and resistance. The body's ability to respond to insulin is dependent on how sensitive the insulin receptors are to the insulin hormone present in the blood. If one has insulin resistance (e.g. in type 2 diabetes), the receptors do not respond effectively even at normal levels of insulin which leads to persistently elevated blood sugar levels. As a result, some people with Type II diabetes and normal insulin levels have to inject additional insulin to keep their blood glucose levels under control. To get an insulin blood test near you, order online and get your blood drawn at your selected Quest Diagnostics lab. Once your insulin lab results are ready, they will be available for download. 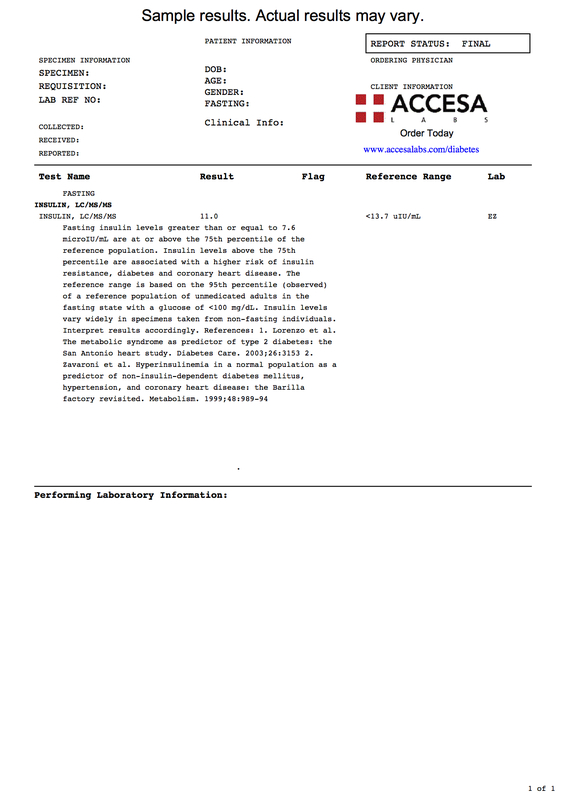 As can be seen on the sample insulin lab report, the insulin blood level is reported as a number and can be compared against the reference range provided by the lab. Insulin Test at Guaranteed Prices.